VIENNA--(BUSINESS WIRE)--European Utility Week 2018 – Semtech Corporation (Nasdaq: SMTC), a leading supplier of high performance analog and mixed-signal semiconductors and advanced algorithms, announced its demonstration of Device Language Message Specification (DLMS) over a LoRaWAN™-based network at European Utility Week (EUW) 2018 in booth B.b70, Vienna, Austria. The demonstration is in collaboration with the Euridis Association and contributions from multiple partners including Actility, Cahors, Semtech, Sicame, and Vientech. “Euridis is proud to contribute in enhancing the use of DLMS standard in various applications and with new LPWAN technologies such as those based on the LoRaWAN protocol,” said Patrick Mortel, President of Euridis Association. With constant urbanization and demand for greater efficiency, utility companies need to augment capacity while developing new solutions to optimize management of their existing assets. Recently, utility companies are leveraging the use of standards to receive greater benefit from digitization. DLMS is a well-established standard for utilities and used for devices with session-oriented communications. Devices using Semtech’s LoRa® devices and wireless radio frequency technology (LoRa Technology) were modified to send DLMS messages via the LoRaWAN open standard demonstrating the value for utilities in mutualizing network connectivity. 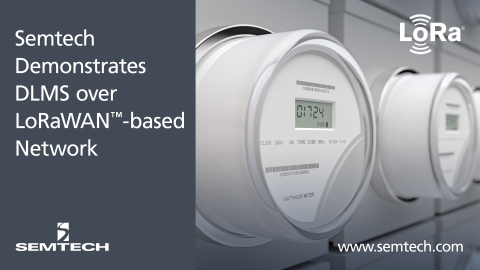 “This new innovation being driven by the LoRaWAN-based ecosystem will enable more utility metering companies to take advantage of the LoRaWAN open standard’s unique combination of low power, flexible deployment options and savings compared to other wireless connectivity solutions,” said Alistair Fulton, Vice President of Product Management and Marketing, Semtech’s Wireless and Sensing Products Group. For an appointment with Semtech at European Utility Week, visit booth B.b70 and visit Semtech’s website to learn more about LoRa-based smart metering use cases.